McGraw-Hill is at CES this year to show off their latest digital textbook platform (they actually have several). 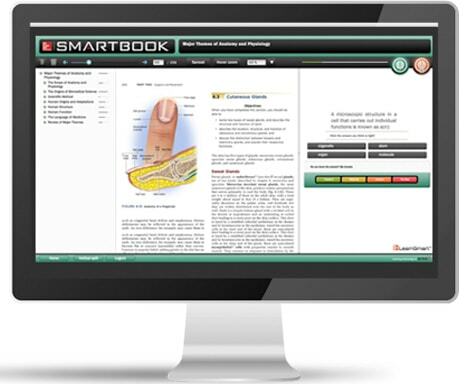 Smartbook is described as an adaptive system that adjusts the reading experience to each student’s pace and mastery level. It builds on the content that McGraw-Hill has developed for past textbook titles and expands upon it to offer students a customized learning experience. So I guess now we know how McGraw-Hill plans to survive the impending implosion of the textbook bubble, don't we? They're going to transition from selling textbooks to licensing software, thus guaranteeing a more secure income stream (or so they hope). I have long been concerned about the health of the textbook market, and recently I came across a piece of info which confirmed my suspicions. According to the American Enterprise Institute, the cost of college textbooks has grown in the past 30 years at a rate faster than the Consumer Price Index, faster than home prices, and even faster than the cost of health insurance. They put together the graph at right to show how the growth rates compare. 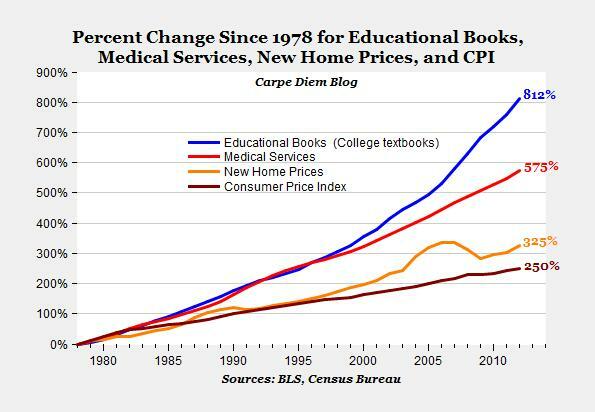 Look carefully and you'll see that college textbook prices have doubled in the past 11 years. If that's not a sign of an unhealthy market I don't know what is. It also explains the rise in Open Educational Material like open source textbooks from the K12 Foundation. Many teachers, schools, and organizations have discovered that the cost of customizing an open-source textbook is far less than buying the necessary textbooks from a publisher. While the chart above reflects college textbook prices, a similar situation is playing out in public schools. One Minnesota school district paid 3 high school teachers to rewrite an OEM textbook so they could use it in class, saving about 80% of the cost of buying the textbooks. Even the cost of printing enough copies for all the students didn't increase the total costs very much. That kinda makes you scratch your head, doesn't it? Folks, whenever you read about a textbook publisher launching a new type of digital textbook, keep in mind that this is the market they are launching in. The publishers are trying to replace the income from selling textbooks with new revenue from licensing software. While this might work in the short run I seriously doubt it will work in the long run. Consider this from the perspective of a school district and you might understand why. A school district will have 2 main choices for digital textbooks. They could follow in the footsteps of Fairfax County Public Schools and pay the textbook publishers millions of dollars each year, or they could take a tithe of those funds and customize a set of textbooks for their own use. Given that school funding is tight due to the poor economy, so-so housing market, and other issues, the financial argument in favor of OEM textbooks is pretty clear. I am in fact surprised that we have not heard of greater adoption of open source content; the textbook publishers must have some very good salespeople. Unfortunately that won't save the publishers in the long run. What I see right now in the push into digital textbooks and services are publishers trying to replace the one-time sale of a textbook with a recurring income from licenses. They want to keep their income at a point near what they are earning from selling textbooks now (and hopefully increase it). The problem with that is textbooks are too expensive as it is; I don't see how schools are going to be able to afford the licenses every year. Actually, what they are trying to do is make sure they have a cut of the used book market. i.e. A high percentage of books by students are bought second hand but the publishers don’t see any of that revenue. By using licenses the overall cost will probably remain the same and the students get a more up-to-date textbook, the only difference is that the used book store goes under. That is certainly true for the college textbook market but it doesn’t explain the similar rising prices in the k-12 market. That doesn’t have the same used market, does it? Interestingly, the price of textbooks has doubled while the fees paid to editors have declined. Editors are being paid less than they were paid in 1995 for the same work. Makes one wonder. That’s one of a bunch of things which don’t make any sense. Where is the money going? Is it being used to support a massive crack habit?